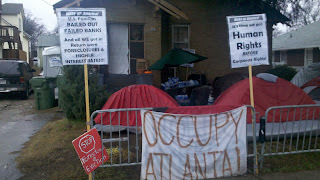 My first Occupy Atlanta(OA)related arrest went down the night OA was evicted from Troy Davis Park. It was an intentional act of civil disobedience I proudly took part in with 51 other Atlanta activists. 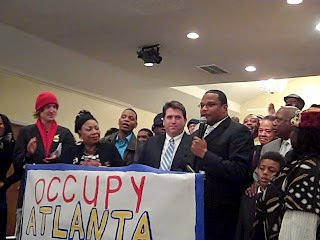 It was only a few days before that when a local TV station declared me the leader of Occupy Atlanta, a title I certainly didn't want, nor could our leaderless movement afford. It was an uncomfortable position for me to be in. I understand that there's no way to control what or how media outlets report the news, and I knew the consequences(both internal and external) of being named a leader. There have been internal difficulties that have come with my perceived leadership, and believe me, it is a perception. In this piece I want to focus on a troubling external consequence of perceived leadership, namely state repression. It was right after the first eviction that several young OA participants took me aside and told me that people from the FBI had visited their homes and questioned them about me. They claimed that FBI agents had asked if I would be open to acquiring weapons, if I had a militant side and such. One of the questioned youth actually gave me the FBI agent's business card. I called it the next day and informed the agent that I knew everything there is to know about Tim Franzen, that I was in fact the worlds utmost authority on all things Tim Franzen. When he asked who I was I stated, "Tim Franzen." I'm not one who's ever felt the need to operate underground, don't mean to dis those that do. I feel proud of the work I do, and there are no actions I participate in that I'm afraid to have associated with my face. I told the FBI agent that he should be ashamed of his actions, that he had no right to run around Atlanta scaring people for no other reason but to crush a movement to address gross economic injustice through nonviolent direct action. Several weeks later I participated in an action on the Courtland street bridge. 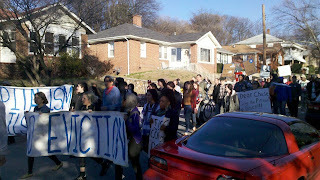 We marched through GSU onto Courtland street. The sidewalks were jam-packed with people. Before the police officers warned the crowd to disperse from the street I had already gotten onto the side walk. One of the police Lieutenants yelled to his officers, "Get him" and pointed at me. The police had to worm their way through the crowd in order to grab me and drag me into the street. When I was dragged into the street, I asked the lieutenant what he was doing and he said, "arresting you." "For being in the street", he said. "But I was on the sidewalk", I replied. "You're not now", he said with a smile. This is what folks refer to as a targeted arrest. On that day there was at least one other targeted from the sidewalk. Targeted arrests aren't just meant to punish an individual, they're designed to suppress and damage a movement. Since that day I've often found myself a target by law enforcement. 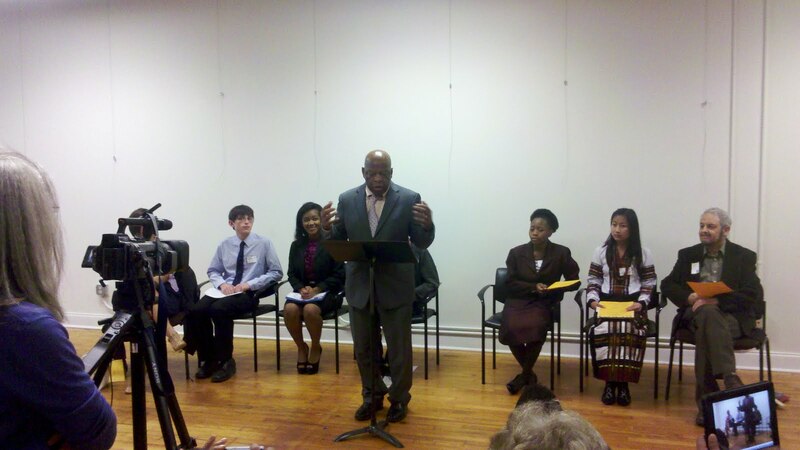 Recently I was asked to be a dignitary on the annual King Day march. I was to march with Brigitte Walker and be one of the many folks who spoke at the rally which concludes the march. It was an honor to ride on the bus with the Orange family, who's legacy goes back decades before I was born. Halfway through the march Mayor Kasim Reed joined the dignitaries and I immediately was tapped on the shoulder. It was one of the mayor's plain clothes officers. He asked my why I was marching with the dignitaries. I told him I was asked to by the organizers of the event. He then laid hands on me, and waved several other officers to assist him in removing me from the crowd. Several dignitaries, including Brigitte Walker and Carmen Pittman began to protest. Finally the Sheriff of Fulton County, who was in plain clothes as a dignitary, ordered the wrongful arrest to stop. I was flustered, but marched on without getting badge numbers or really thinking too hard about filing a complaint. I remember thinking all in all, it's just not a big deal. Yesterday, after about a hundred OA protesters marched to a Chase Bank branch and demanded the bank work with one of many families that got ripped off by the very predatory loans that help crash our economy, I was arrested along with Shab Bashiri. At the protest there where several pieces of household furniture placed in front of the bank door. There was other debrie placed there as well. 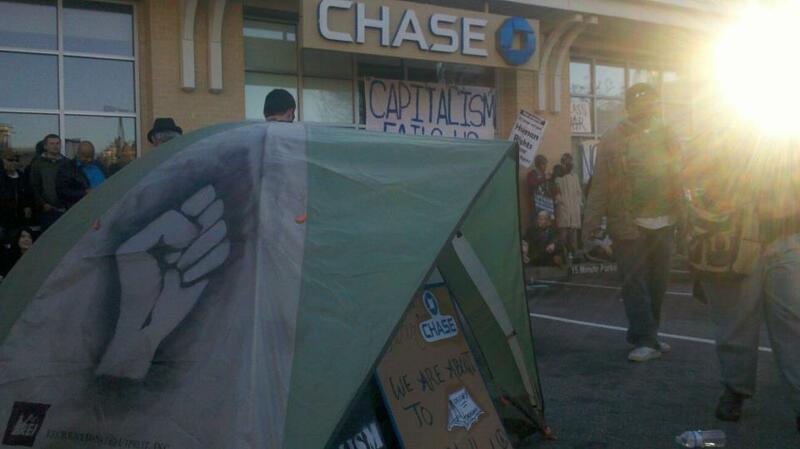 The idea was to create the painfully familiar scene of an eviction right in front of a bank responsible for so many. Much in the way AFSC attempted to bring the Iraq war home with our "Eyes Wide Open" campaign, organizers of the action brought the foreclosure crisis to Chase Bank's doorstep. After the demonstration was over Shab and I chose to ride with a friend back to our car. We would have walked with the crowd, but it was Shab's birthday, so we had a party to get ready for. As we drove we noticed police following us right away, then we noticed channel 11 was following as well. When the blue lights came on I knew what was about to happen. I started texting folks right away. By the time police asked Shab and I to get out of the car, there was a small crowd of OA folks and channel 11 was filming. The arresting officers let Shab and I know that we were being arrested for littering. To avoid dealing with more OA folks and the media, one of the lieutenants asked that we be driven to the Manuels Tavern parking lot. When asked why the officers followed us from the bank and waited until we were several miles away to pull us over he replied,"I was ordered to." Once we were brought to Manuel's parking lot, three unmarked cars pulled up, each one belonging to Atlanta's top brass. Chief Turner's #1, and #2 cops circled the car Shab and I were locked inside of along with about a half dozen other police. I couldn't tell what they were talking about, but I know there was some discussion about what our charges would be. They put the two of us, just two, into our own paddy wagon. The driver proceeded to drive around the city for over an hour while Shab begged to use the restroom. The officer then stopped at Buddy's on Highland to use the restroom himself and get a snack break. Finally he got us to the city jail, where we were told we should be out in an hour or so. This was around 9pm. We didn't get out until almost 4am, largely due to the fact that there was a problem with our charges and APD had to come back and fill something out. I later found out that Joe Beasley called Chief Turner and told him he needed to get me out. I have no doubt that sped up the process. Today I attended a rally for international dignity with our Middle Eastern brothers and sisters. We marched to the CNN center and it was beautiful. Hundreds of people from different corners of the globe calling for global resistance to oppression through economic injustice. While participating, my arm was grabbed by a police officer who claimed to know me well. He told me I needed to get off the sidewalk immediately. I told him that he needed to remove his hands from my body and took note that he was bothering no one else in the crowd of hundreds. 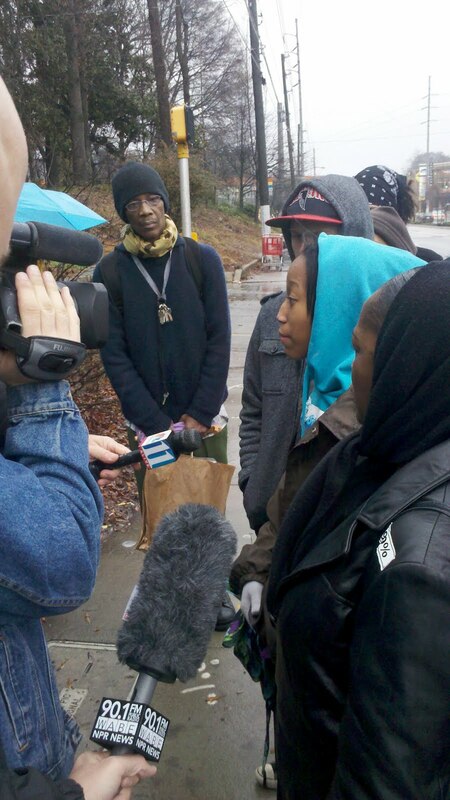 Thankfully a bunch of OA folks surrounded me, letting the officer know mass arrests awaited if they targeted me. I've decided that this behavior is worth calling out. It is unacceptable to target a few folks in an effort to shut down a movement. 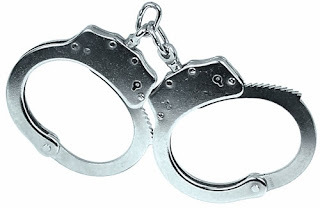 A targeted arrest should be seen as an attack on everyone associated with the Occupy movement. To let this slide is a disservice to others and our movement. There are many lessons to be learned from the last few months as far as targeted arrests go. One is an old rule, march with the crowd. If you decide to seperate from the crowd, beware. There are other lessons, I'm just not ready to articulate them on this blog. This is perhaps the most personal blog post I've ever written, but I feel it's somewhat overdue. I'm not the first person in the Occupy movement to be the victim of targeted arrest, and I surely will not be the last. In fact, I'm sure I have several trips to jail in store for me in the near future. From now on, I'm not going to write off this police behavior. Im also not going to allow the threat of targeted arrests to change the way I work. I reject the idea that I should not attend actions, or that I should change my wardrobe or cut my hair, and am willing to pay whatever consequence they have coming. The simple fact is that we are a threat to an economic system that year after year gives more privledge to the weathiest at the expense of everyone else. We live in an important moment, a beginning, an uprising. You may not know that you are a part of it yet, but we all are. To Occupy means to exist in a space, and that is what we are fighting for. To exist in a space where our voices are elevated to the same height, a space where opportunity is shared and we all have enough to thrive. This world is beyond possible. This past Friday, January 28th, Occupy Atlanta Marched with the Pittman family to a Chase Bank branch with one simple demand, give the house back. For marched was sparked by Chase bank's unwillingness to offer a deal that would keep the Pittman's in the house that's been in the family since 1953. The march brought together around 100 or so activists. The group was remarkable diverse in most ways measurable. Once at the bank there was a number of actions that went down. First it should be noted that the bank itself was shut down several minutes before we showed up. Apparently they were on high alert, along with several other Chase branches in the area. 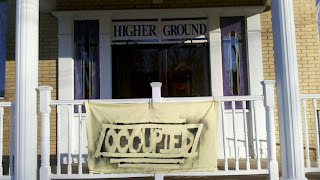 Once outside the branch some participants put old furnature outside Chase's door as if to simulate an eviction scene, some broke out into dance, some chanted slogans like, "shut it down", there was even an interfaith prayer service, attended by several Quakers, outside the bank. The demonstration managed to shut the Chase branch down for the last two hours of the bussiness day as well as make a clear statment to Chase bank that holding the Pittman home is a lose lose scenario for them. It's clear that Occupy Atlanta and other organizations will continue to escalate until Chase agrees to truly work with the family to insure they can stay and own the house they've called home for almost six decades. There was one targeted arrest, but I'll be writinging about that in a seperate post. Like many families across the nation, the late Ms. Eloise Pittman was a victim of one of the worse cases of predatory lending. The Pittman family has been fighting to save the family home since November 2011. This house for thisfamily is more than a building that gives shelter. It is a home that has been passed down generations since the 1950’s. This past week we have finally been able to get Chase bank to negotiate with they family. The options they have laid out are terrible. They either want the family to leave or pay over $400,000 for a property that's worth around $100,000. Their options are not acceptable. When Chase bank needed a bail out they got one to the tune of billions at practically zero percent interest. We will not continue to allow big banks, like Chase, to continue to make profit off the backs of those that they refuse to assist. American Friends Service Committee Stands with the Pittman family as it is our belief housing is a human right. A Win For 108 Year Old Vine City Church! 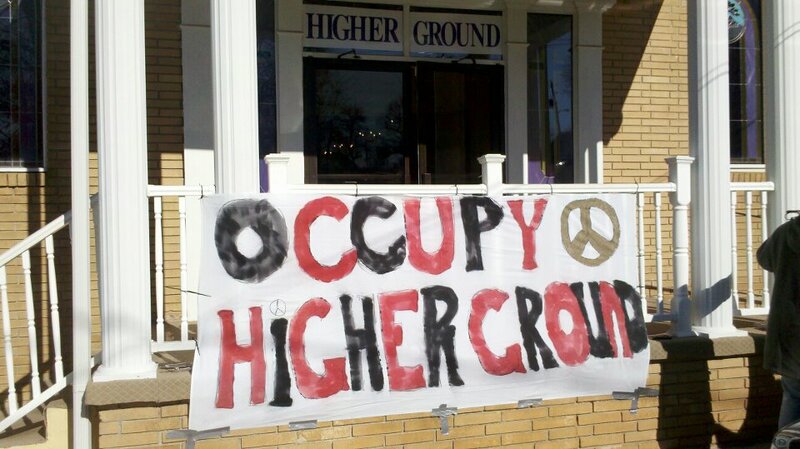 Just six days ago Pastor Dexter Johnson of Higher Ground Empowerment Center (HGEC) reached out to Occupy Atlanta in the 11th hour of the congregation's fight to stay in the 108 year old Vine City Church. 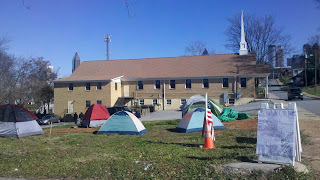 Late Wednesday(1/11/12) Occupy Atlanta rolled out tents and within 12 hours BB&T retreated from their attempt to evict the church. After several hours of negotiations with between BB&T Bank, Occupy Atlanta, HGEC, and Joe Beasley with Rainbow PUSH, we have a deal that HGEC can more than live with. HGEC is going nowhere, not only did they get their deed to the land back, they have been given back the nine lots surrounding the Church for development, and a commitment from BB&T to meet again, with in 30 days, to discuss ways they can justly invest in the Vine City Community. 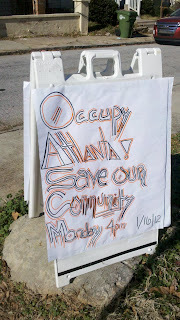 Today is a victory for HGEC, Occupy Atlanta, Vine City, and all the 99%. This victory was facilitated not by experts but by everyday folks working together to fight for their communities. A big thanks to BB&T Bank for doing the right thing, and a big thanks to Rebuild The Dream for facilitating a dynamic national petition drive to save the 108 year old Church! "Today was a triumph for Higher Ground! 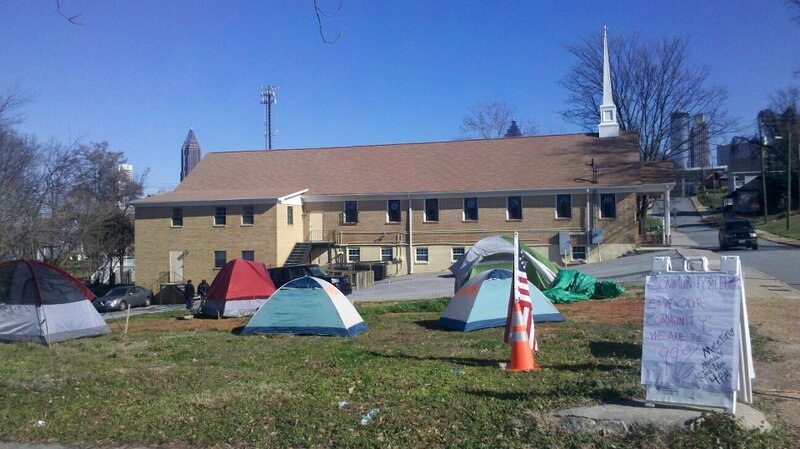 Thank God for Occupy Atlanta, Thank God for Brother Joe Beasley", said HGEC Pastor Dexter Johnson. Bringing the deed to the Church home would have simply been impossible if a dynamic grouping of Atlanta folks and organizations had not come together and shared resources to make the win happen. American Friends Service Committee, National Action Center, Grandmothers for Peace, Georgia Peace and Justice Coalition, and the Vine City Neighborhood Planning Unit all played an important role. This win is just a beginning. The real work is organizing the Vine City community. The question we're all asking is, how do we use the momentum of this win to galvanize Vine City? Idea's on where to start with the laundry list of problems that have hit the community. 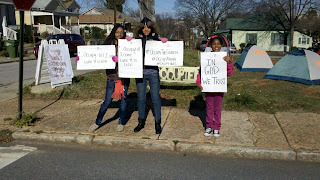 While folks where waiting at the church for the word on weather the deed was coming back to the churh, Occupy Atlanta and HGEC started getting a leg up on the clean up effort in Vine City. Those that are interested are invited to join us for a community meeting this Saturday, 1/21, at 1pm at Higher Ground Empowerment Center, 561 Spencer Street. 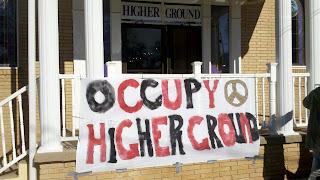 Tomorrow(1/17/12) at 9:30am we will be holding a press conference and rally to save Higher Ground Empowerment Center(HGEC). The time and date is significant because the bank is set to negotiate with HGEC, Occupy Atlanta,and Rainbow PUSH, at 11am. Last week Occupy Atlanta was able to help the Church put off immediate eviction from the building they've called home for over 108 years. Despite false claims from BB&T lawyers and executives, it seems clear that the bank does not plan and working out a deal that would give ownership back to the Vine city church. BB&T has also been openly dishonest with the public, claiming that they never intended to evict HGEC, we know this to be sadly false. It is time that BB&T live up to their "Values based approach" to dealing with foreclosures and make a deal with HGEC with gives ownership to the church, time for BB&T to do the right thing. 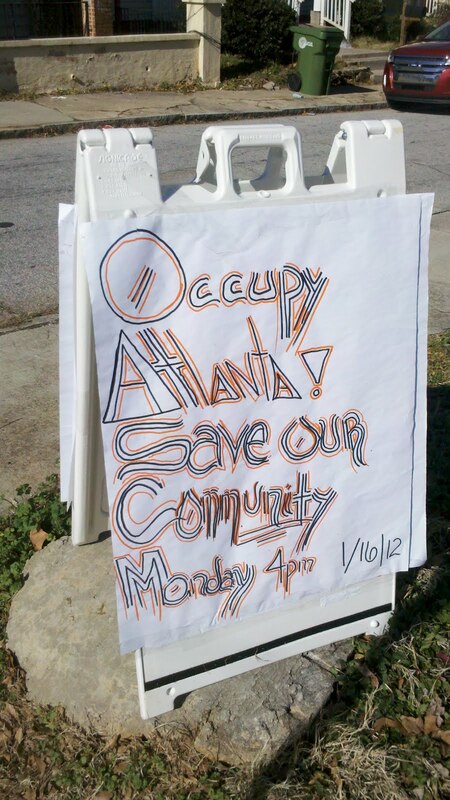 Occupy Atlanta will also be delivering a petition, which was organized by Rebuild the Dream, to save the Church to BB&T tomorrow. There are over 60,000 signatures from people all over the country. 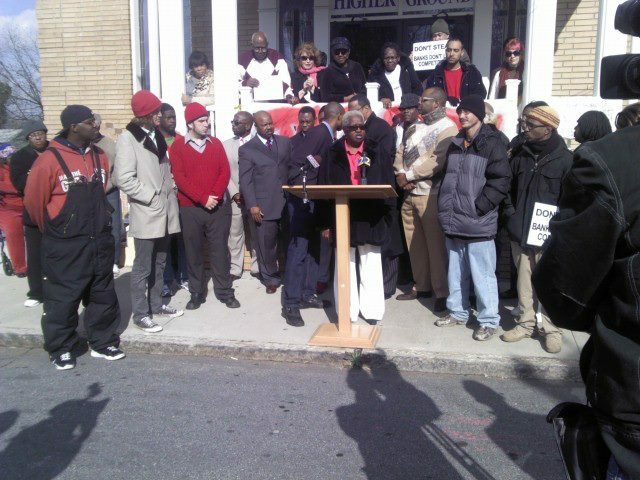 The fight to save HGEC from BB&T bank isn't just about saving a church, it's about saving a devastated community. Vine City is the most undeserved community in the downtown area.There are parts of the City that resemble post Katrina New Orleans. Tomorrow after our press conference members of the HGEC, the Vine City community, and Occupy Atlanta will begin the process of fixing up Vine City. It's clear that we can no longer wait around for the Mayor to wave a magic wand, if there is to be change, it's going to have to come from everyday people in the community, it's going to have to come from the 99%. In this spirit we will be picking up some of the overwhelming amount of trash around the neighborhood.We also plan on launching an effort to get signatures on a petition to save Bathune Elementary School, which is within eye-shot of HGEC, and is under threat of being shut down. Joining us for the press conference tomorrow will be Dr. Joseph Lowery from the Peoples Agenda, Joe Beasly from Rainbow PUSH, Talk Radio Host Rob Redding,American Friends Service Committee and many other community leaders and stake holders, and organizations. 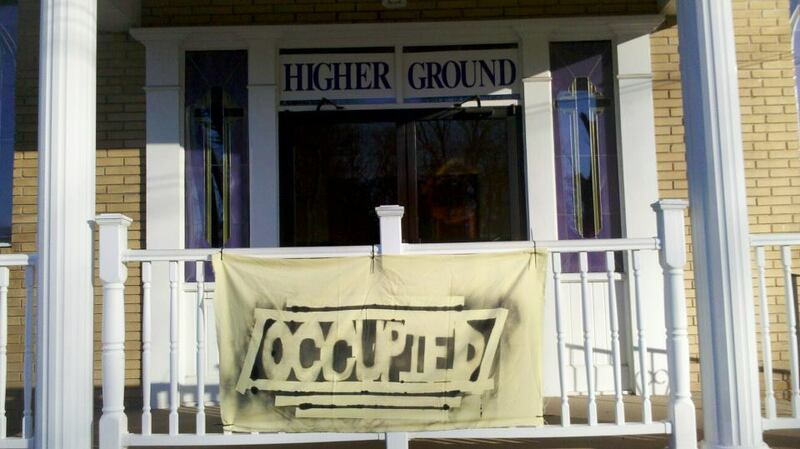 Higher Ground Empowerment Center(HGEC) is a neighborhood church in the heart of Atlanta’s Vine City. For the past 108 years, Higher Ground Empowerment Center has been a pillar in the historic Vine City community, one of Atlanta’s most under-resourced communities. HGEC has offered an array of much-needed programs and services including free healthcare screenings, a food pantry, job fairs, an annual Vine City Thanksgiving dinner, Karate classes for youth, Saturday tutorials, and summer camps for students. In 2008, the church suffered a major blow in the form of a disastrous tornado that ripped apart the property. In order to rebuild, the church was forced to take out a loan, one that became increasingly difficult to pay back and unrepresentative of the resale opportunities as donations and property values fell during the recession. The church repeatedly attempted to refinance the loan to be more representative of the property’s value, but BB&T, a company whose CEO, Kelly King, claims that their “foreclosure process is a values based approach where [they] work with our clients,” has not responded. The cruel irony is that BB&T bank spends about $5 million dollars a year on teaching positions and research on what they refer to as “the moral foundations of capitalism.” We find these morals and values suspiciously absent when the opportunity to profit off of the very people who bailed out BB&T to the tune of $3.1 billion comes about. 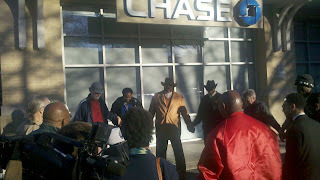 The day before the HGEC was to face BB&T in court over their right to stay in the meeting, Pastor Dexter Johnson reached out to Occupy Atlanta for help. After Occupy Atlanta set up tents and held a press conference,BB&T began back peddling, falsely claiming that they never intended to evict the church, and that they were willing to work out a deal. The deal BB&T wants to work out is unacceptable. BB&T now says that HGEC must lease the property from the bank. HGEC, Occupy Atlanta, Vine city community members, and other social justice organizations including Ranbow PUSH Coaltion, and American Friends Service Committee, are committed to fight for HGEC's right to own the church they have called home for 108 years.This coalition has also been joined by Rebuild the Dream, an organization that started a national online petition that has gathered tens of thousands of signatures. 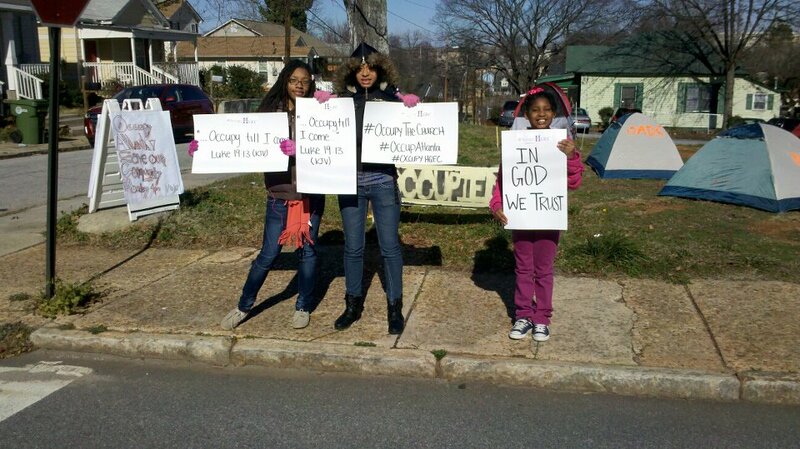 Occupy Atlanta has organized a rally to save the church this Tuesday, January 17th, at 9:30am at the Church(561 Spencer st, Atlanta).The rally is important because HGEC and Occupy Atlanta are set to meet with BB&T at 11am and the pressure needs to be on. American Friends Service Committee will be present, and we hope you will be too! I must also say that Vine City is the most underserved community in the downtown area. While I canvassed the neighborhood I shot some footage. It's truly the shame of Atlanta, and a clear consequence of extreme wealth consolidation. Let the fight for HGEC be the beginning of the fight to improve deplorable conditions in Vine City. In the past decade Americans have been subject to a new crime wave: banks robbing families of their homes. Since the early 2000s banks have been targeting communities of color with predatory loans. In an attempt to feed the monster that we now know as the housing bubble banks began handing out loans that appeared, on face, extremely attractive. The catch: these loans turned ugly fast. By creating and pushing financial instruments like adjustable rate mortgages with teaser rates or pay options, loans with balloon payments, and interest only clauses, banks offered loans that were affordable at a glance, but impossible to pay a few years down the road. In essence, they stacked the deck against working Americans. The Pittman family has lived in their home in the Old Fourth Ward since 1953. The late Eloise Pittman was a pillar in the community and a leader at her church. 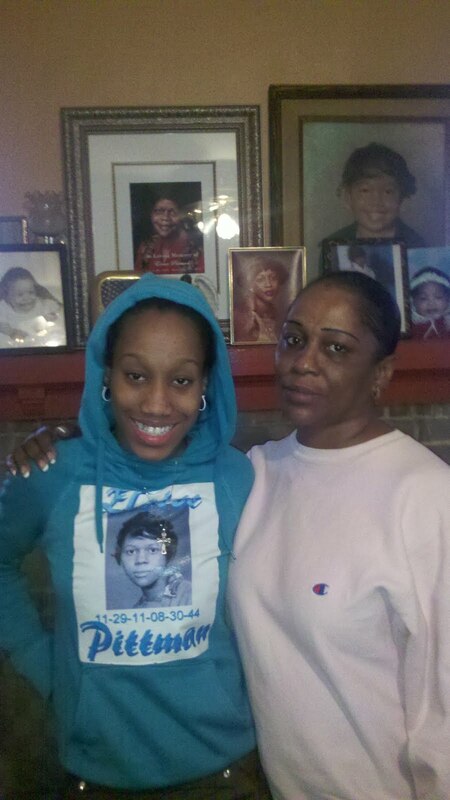 She was also a victim of one of the worst predatory loans that Occupy Atlanta has ever seen. When Eloise, a 62 year old retired school board employee, wanted to refinance her home in 2006 Chase gave her an adjustable rate loan totaling over $300,000 for a home that, according to the tax assessor, was worth half that much. Eloise was the victim of a repulsively predatory loan. Eloise Pittman passed away in late November. Her family is now left with a mountain of debt, and is trying to save a home that’s been in their family for nearly 60 years. Chase has been unwilling to find a solution that keeps them in their home. The mortgage is owned by Chase. Today, we appeal to you for help. 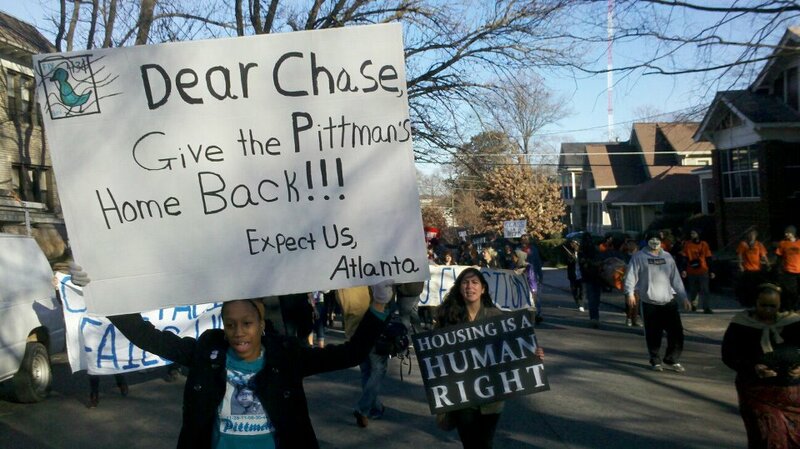 Can you take the time to call, fax, and email the CEO of Chase Bank with a simple message; Make the Pittman family’s mortgage work. Rectify predatory loans. Keep the Pittmans in their home! All this action takes is the commitment to send a few messages, the commitment of a few minutes of your time. That commitment could help keep the Pittmans in their home and send a message to the big banks that we will not let them make Americans pay the price for their irresponsible practices. We are the 99%, and we out number bank executives. American Friends Service Committee stands with the Pittman family, we have the resources to ensure that everyone has the right to a home. 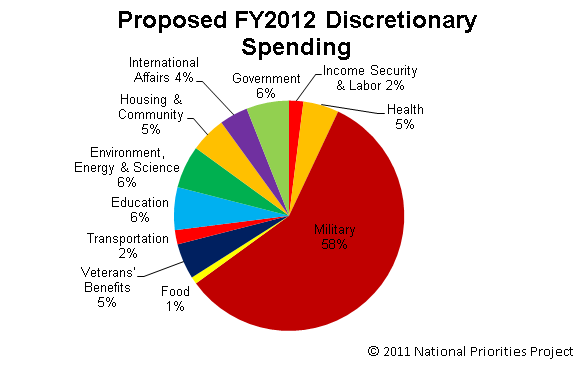 Military Spending Is Killing Us: Set the Record Straight. What does that mean? We will continue to spend $2.1 million every minute of every day on the military – an unethical and unsustainable policy. Yet lawmakers are already clamoring to oppose the proposal, suggesting it would hobble US defense, cripple innovation, and cost jobs. Please write your local paper to set the record straight: Slowing the growth of the military budget is not a cut in a budget that already has doubled since 9/11 and consequently has devastated spending on human needs. Nearly every other area of federal spending - investing in jobs, health care, affordable housing, and education – has been cut, putting real security more at risk. Investment in people and communities, increased reliance on diplomacy, and supporting sustainable human security by meeting human needs at home and abroad is what will ultimately make our world more safe and stable. The Obama administration’s new strategy remains ominously more of the same. It plans to focus more resources on naval and air power in the Strait of Hormuz to contain Iran and in Asia to manage China’s rise. It envisions the use of more drones and more covert operations with Special Forces. It calls for increased investment in cyber and space war capabilities. 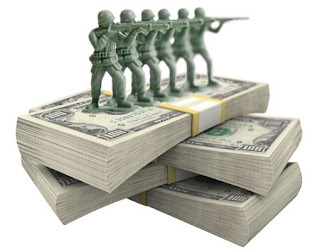 It affirms that the United States will continue to be the world’s leader in deadly arms sales and transfers. After agreeing to increase spending on nuclear weapons by $85 billion, the Guidance document calls for unspecified reductions on this project. It seeks to pass troop burdens to allies, particularly those in Europe. It envisions fewer wars like Iraq, and more wars like Afghanistan, where coordination between the Pentagon and the CIA is the model. For more on the insidious linkages between the two agencies, see our resources from our Afghanistan 101 blog and the audio from the Legacies of War in Iraq discussion. Your voice is needed to change the course ahead. Write your local newspaper to remind everyone real security lies not in more military spending, but in more investment in our communities and the next generation. 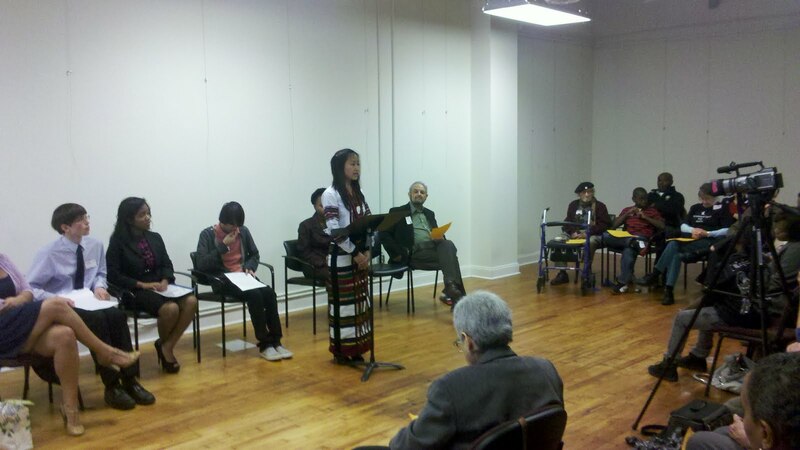 This past Sunday Grandmothers for Peace held an award ceremony for their first annual "Essay for Peace" contest. Youth aged 13-18 read their essays to a packed house. Congressman John Lewis was the keynote speaker, and he gave a moving talk about his experience as a youth working for justice and peace in the south. 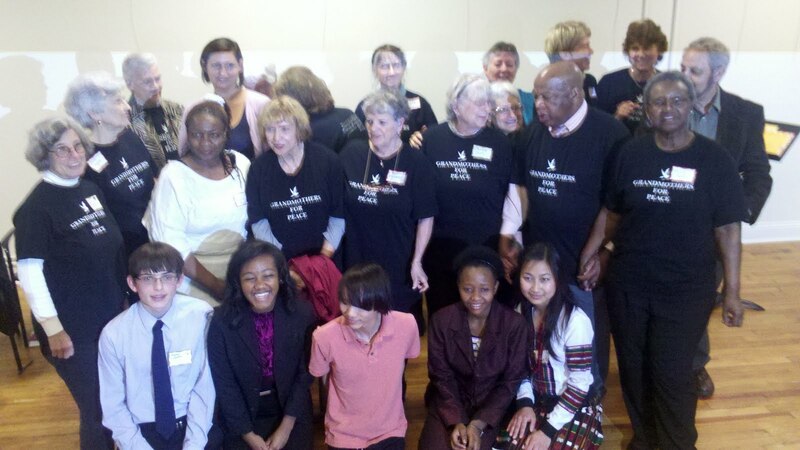 American Friends Service Committee was humbled to play host to such a special event. It was truly heartwarming to see the effort Grandmothers for Peace put into making the ceremony a life changing experience for all the young winners. We look forward to working with Grandmothers for Peace in the future.